You can pitch close to 50 tents on this campsite. Easily accessible, bathrooms and water available, too. Dogs are allowed at the campsite, but not allowed on any state park trails. It's not recommended that you bring them, but they are allowed. $225/night with enough room for 50 campers. Alice Eastwood is the ideal campsite for big groups or outdoor celebrations just north of San Francisco. Right off Panoramic Highway, deep in the Redwood forest sit two campgrounds welcoming up to 75 people. It has all the amenities for a big party and is easily accessible from the city, just follow the single lane road down the mountain for about a mile and a half, and Alice Eastwood is easy to find. As you continue to descend, the trees become taller and the forest gets denser. You’ll cross over a small bridge, passing waterfalls and a gentle creek full of wildlife. It’s a quiet and quaint campground you and friends will have all to yourselves. 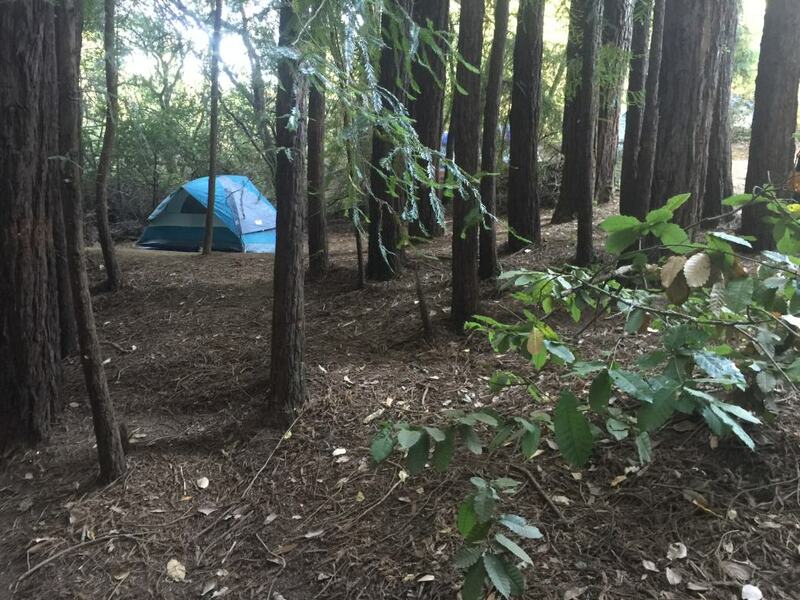 Alice Eastwood is the only big campsite around Mt Tamalpais, welcoming groups and parties. People get married here, school groups host retreats here, it has even been rumored to host small music festivals in the past. If you need a big open campground, look no further than Alice Eastwood. Besides the space to pitch your tents, there is a wide-open shelter space with picnic tables perfect for hosting a big meal or dance floor. There is plenty of room for a lot of cars to park, two big bathrooms and drinking water. Recruit your colleagues for an office retreat or gather your family for a gold old-fashioned reunion. Big groups will love Alice Eastwood. It’s set in a shady large area with 20+ different spots to pitch a tent and plenty of picnic tables and firepits. If you want to party in seclusion with your friends, this is the best place to do it. There isn’t much sun here, but you can hike to the sunny spots on various nearby trails. Climbing and biking routes are also around the area, and the ambitious fisherman might catch something small in the creek. The nature enthusiast and partier will surely fall in love with this place, so bring your whole crew and pack for a weekend party. Alice Eastwood is just off of Panoramic Highway on Mt. Tamalpais. To access it by car, the combination code is needed to unlock the gate. With a reservation you’ll get the code. Travel just over a mile down a narrow winding road to the end where the campgrounds are. You’ll likely need to reserve it a few months in advance during the busy season. Dogs are not welcome on state park trails, but they are welcome on the campground. There are great uphill trails all around the campsite for hiking and biking.